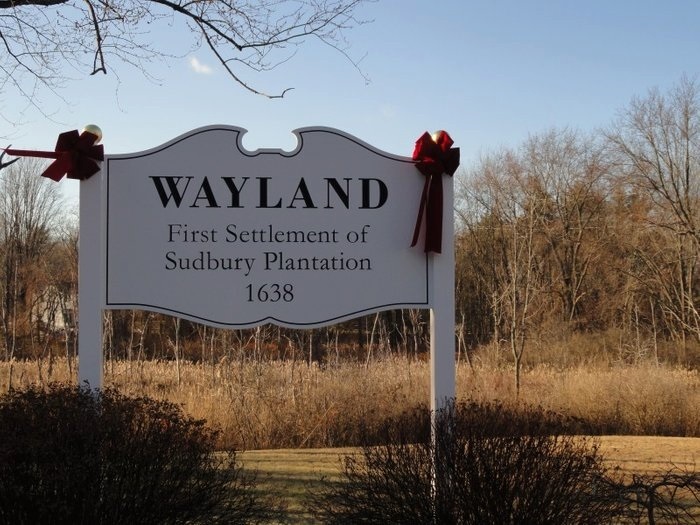 Wayland had a population was 13,444 at the 2010 census and borders Lincoln, Sudbury, Weston, Framingham, and Natick and is less than 15 miles west of Boston. Wayland is the home to many urban professionals due in part to its peaceful setting and its close proximity to the city of Boston. It includes the area known as Cochituate. In addition, the school system is known as one of the finest in the state. Wayland also takes great pride in its preservation of the forests, marshes, and fields that surround the Sudbury River. These natural resources provide residents an opportunity to enjoy these areas for passive recreation, and Lake Cochituate also borders on Wayland and is a full recreation lake. Wayland Town Center is located in Wayland. With easy access to all parts of the Greater Boston region, Wayland is among the wealthiest towns in the state. Due to its location at the halfway point between Worcester and Boston, Wayland serves as a bedroom community for numerous urban professionals; this idyllic residential community also boasts one of the finest school systems in all of Massachusetts. Easy access to downtown Boston, as well as the neighboring economic hubs of Waltham, Natick, Framingham and Burlington, has allowed Wayland to flourish. The newer town center plaza is tenanted by a unique mix of national and regional credit tenants including Boston Sports Club, Ace Hardware, Panera Bread and The Local, an upscale gastropub voted Best of Boston. In addition, the property includes 17,000 square feet of medical office space which is occupied by Beth Israel DMC, Joint Ventures, and a dental practice. The property also consists of 12 second-floor apartment units.